Russian Translation by Natalya Mann, Ph.D.
[Russian Text Translation] : Text translation by e-mail & fax. From $5/100 words for general correspondence. 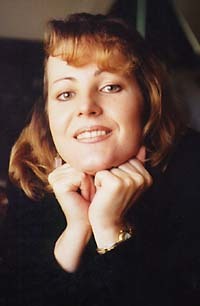 Natalya Mann, Ph.D. (Linguistics), native Russian, 13 years as English teacher in Russian schools and universities. [Professional Resume] : Russian Translator, Natalya Mann's professional resume. Here are four of my friends with me at the University in Volgograd (Stalingrad), Russia. This photo was taken during the mid 1970's. I am in the middle. In Russia, university education was free, but there were about 15 applicants for every available opening so the competition was very stiff. Now many universities can not afford to offer free instruction and they charge tuition. Students may interrupt their education for compulsory military service but it is more common to postpone military service until education is complete. Some universities have military departments for students who want to become military officers. Notice the use of fur as clothing. Fur is commonly used even today in Russia because of the long cold Russian winters. One of the University buildings is in the background. This is an old photograph of my mother. I think she was about four years old. It was taken in a portrait photographer's studio in Russia during the early 1930's. Notice the doll she is holding. It's dress is decorated with lace. Such style is common in traditional Russian costume. The girl is holding flowers. Flowers are very popular in Russia. Students usually bring flowers to school for their teacher on special occasions. Here are some friends recreating by the Volga River at Volgograd (Stalingrad), Russia during the mid 1970's. There are some beaches established along the river for people to enjoy. The beaches are mostly across the river from the city and it is common to take a ferry boat across to them. The Volga River is about one mile wide at this point. The water is always rather cold in the Volga, even during the hot summer months. Notice the small tent. We actually had several tents and spent a couple days camping, fishing, catching crayfish, lying in the sun, swimming, etc... In Russia it is popular to eat crayfish with beer. Usually two or three students live together in one room during the 1990's. They can rent a T.V. set or a refrigerator. Usually there is one bathroom for two or three rooms and one shower for each floor. Private cars are very expensive in Russia and they are considered to be a luxury rather than a means of transportation. This car is of one of the popular Russian models, "Moskvich". This particular car is a model from the late 70's. In the background, you can see a Russian ambulance. The sign is advertising a vacation at a resort location. The sign says, "Welcome to Truskavets!" This photo was taken during the early 1980's. My father is anticipating a vacation there. Truskavets is a health spa that used to host military people on leave. It featured mineral water for bathing and drinking. Truskavets is located at the verge of the Carpathians, some 75 miles south of Lvov, Ukraine. The text on the billboard is in Ukranian. There are also many popular vacation resorts along the Black Sea coast as well as in the Caucasus Mountains. The Caucasus Mountains are in the area of Chechnya and the city of Groznyy. My daughter, Alexandra, attended first grade in Volgograd, Russia. I actually enrolled Alex in the first grade early in order to have her complete one year of Russian education before coming to America. The Russian education system is one of the best in the world, even today. The emphasis of the Russian education system is on academics. Unlike in American schools, homework is assigned to all students beginning from the first grade. The theory is that the children must practice what they learn if they are to retain the knowledge and be proficient with it. This photograph was taken in 1996 by my future husband, Dave, while he was visiting there. These are monuments at Mamayev Hill in Volgograd (Stalingrad), Russia, my city of origin. This is the place where the Soviet army defeated Hitler's army on the eastern front during World War II. It overlooks the city. The figure in the background is the "Motherland" statue. It is about 200 feet high and stands on the peak of Mamayev Hill. There, the battle raged more than 5 months while the front moved about over this hill. There were over a million casualties. The city was totally destroyed. Every building now in Volgograd is no older than this battle. The postcard illustrated here was published in Russia around 1988 (copyright date). It illustrates Father Frost, the Russian equivalent of Santa Claus. He is usually illustrated with his granddaughter, the snow maiden, Snegurochka riding with an evergreen tree and presents in a traditional Russian troika. A troika is a sleigh drawn by 3 horses yoked abreast. The banner reads, "Happy New Year!" Christmas is now celebrated in Russia on January 7. After the Russian October Revolution in 1917, the calendar was changed to place Christmas after New Year's Day. This was done in order to place more emphases on the non-religious New Year's Day. For this reason, the Russian Father Frost is associated with New Year's Day rather than with Christmas. I am in a Moscow City Park along with Alex and her friend, Ulya. There are a lot of such parks in Moscow and many other Russian cities. The tree is a birch tree. The birch tree is perhaps the most well know tree in Russia. Some people consider the birch tree to be a symbol of Russia. My daughter, Alex, and her friend, Ulya, play on the Volga Embankment near the Volga River in Volgograd (Stalingrad). The Volga river is perhaps the most important river in Russia for transportation and commerce. It flows almost the entire length of western Russia from north to south. At this point it is about 2 km. (over a mile) wide. Here is a photograph of a Russian Submarine near Sevastopol. This is in the region of Crimea on the Black Sea. Sevastopol is one of Russia's most important sea ports. It is considered to be a closed military city so people (especially foreigners) must have special permission to enter here. My great uncle and a nephew enjoy skiing during a holiday near Moscow. Cross country snow skiing is a very popular sport in Russia because of the long, cold winters and large amounts of snow that occur there. Ice (figure) skating is also very popular in Russia. In winter it is common to see open skating rinks full of children and adults among the buildings. These are good examples of Russian copper art. Notice the main themes: nature, birch trees, and pretty girls. These things are characteristic of Russian art. There are Russian songs and poetry about birch trees that personify them as slender, young, beautiful Russian girls. Many products are still sold in small shops in Russia. This small bakery is located in Volgograd (formerly Stalingrad). The bread is sold unwrapped. It is simply handed to the customer who puts it into his own shopping bag. Russia is known for it's bread. I am particularly fond of Russian rye bread. Sliced bread is unheard of in Russia. I never saw a loaf of sliced bread until I came to America in 1996. Ordinary Russians shop on the sidewalks of Volgograd for everyday needs. At these markets, almost everything is available from fresh fish to clothing. My husband, Dave, took this photograph as he visited in 1996. He was amazed to see a whole hog's head for sale from one of these tables. We went for a short walk and upon returning saw that the hog's head had been sold. Russian Orthodox church members participate in a baptism ceremony. Until the collapse of the Soviet system this kind of activity was restricted. Members of the communist party were strictly forbidden to participate in such activity. During the Soviet era, if you were not a communist in Russia, you could hardly have success in you community or in your career. No Russian table is complete without a samovar. This is an urn in which water is boiled to make tea. In Old Russia samovars were heated with coal. Now most of them are electric. Russians like to drink sweet black tea with lemon, varenye (kind of jam but thinner) or milk. You can see a small tea pot in the foreground. This contains very strong (concentrated) tea. The silver samovar contains hot water with which to dilute the tea to the desired strength. Each cup is diluted to the individual's taste. This picture was taken during 1996 New Year holiday. This was in fact the occasion where my husband, Dave, first met with my relatives in Russia. Even as far south as Volgograd, the Volga River freezes quite solidly in the Winter. Here, my husband Dave and I, are sitting on a large slab of ice halfway across the Volga. The surface has frozen to a depth of about 2 meters (6 feet). We are about 1 kilometer from the nearest shore. The ice does not freeze smooth but rather rough as you can see. During the winter, people regularly commute across the river by foot to work or shop in the city. This is the same place the Russian defenders had to cross the frozen river with supplies during the battle of Stalingrad in WWII. The Volga is the longest river in Europe. It flows over 3,500 kilometers (1,900 miles) from its source in the Valdai Hills, northwest of Moscow. It empties into the Caspian Sea below Astrakhan. It is linked to the Moscow river by a canal, to the Baltic Sea by the Volga-Baltic Waterway, and to the Black Sea and the Sea of Azov by the Volga-Don Canal. The Caucasus Mountains are one of the tourist attractions south of Russia. The Elbrus range is the highest in the Caucasus. This picture was taken in 1997. In the background you can see Mt. Nakra covered in the clouds. Have you ever eaten Russian bread? In Russia, a meal is not complete without bread. It is considered to be the most staple food. Bread is considered to be one of the national symbols of Russia and is one of the ingredients for the familiar "Bread and Salt" ceremony. I lived in Volgograd, Russia for almost 40 years and until I came to the United States in 1996 I had never seen a loaf of pre-sliced bread. My favorite of all the Russian breads is black rye bread. I was not able to find anything similar in the United States. After about 2 years, I adapted a receipe given to me from another Russian friend. This involved converting units from metric to English and adjusting the moisture so it would work in a bread machine. The result was almost identical to the best black rye bread I had in Volgograd. Here is the receipe. Try it and Enjoy. The photo at the left was taken in a Russian bakery but the bread shown is not black rye. If I get a good photo of black rye, I'll show it. What's in a Russian Name? Did you ever notice a pattern to Russian middle names? Well, here's an explanation of how Russian names work. As all Russian children, I was given only my first name by my parents. My middle name already existed even before my birth. The matter is that in Russia each child has a middle name that is constructed of their father's first name. This name is called a patronymic. Being a daughter of Alexander, my middle name or patronymic is Alexandrovna. This name was constructed by adding the ending "ovna" to my father's first name. This indicates that I am a female child of a man named Alexander. As for my brother Victor, his patronymic is "Alexandrovich" where the ending "ovich" indicates a male child of Alexander. The photo of my family illustrates this naming system. From left to right in the photo is: Alexander (my father), Natalya Alexandrovna (me), Victor Alexandrovich (my brother), and Tamara Dmitriyevna (my mother). My mother's father was named Dmitri. Sometimes there are special rules for the spelling of patronymics. When answering the question, "What's you name", Russian people reply in a particular way according to their age or status. Children and students give their last name first, then their first name. (ex: Lebedev, Ivan). Adult people give their last name, then the first name and patronymic. (ex: Grishina, Natalya Alexandrovna). In both cases the last name is given first. I am very thankful to my father who brought home a chess set one day and showed me the magic of putting the pieces to life. Since then I have been addicted to chess. But there were not only roses on the way to understanding the strategy of the game and mastering the theory. As many kids I preferred practice to theory and asked my father to play with me. He made me learn theory first. I had to drill a lot of beginnings, middles and ends of the game and then he agreed to play with me. I made my best efforts to win but never could. The matter is that my father was a military man and a professional chess player. He used to participate in many competitions which were very popular among military officers and had many awards and diplomas for winning. I was dreaming one day to have my own chess awards. But I had to wait for some years. My first diploma appeared when I was in the 9th grade of high school. Having become a chess champion on my school I was sent to compete with the students of our district who represented about 10-15 schools. The best players were invited to the final competiion where the best chess players from all the schools of the city of Volgograd met. As you can guess I brought home my first diploma that day. I was very proud and my father said it was a good start but he still didn't take me seriously and he was right because I could not beat him.